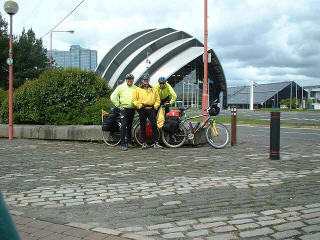 This is the next instalment of the Multidaymens adventures while they cycle from Lands End to John O Groats. The time has been very difficult since our last ride, with Jane tragically passing away last December. It would be the first time we had either started or finished a ride with out her being along to shout encouragement in her unique style and presenting her T Shirts. But life goes on and I know how positive she was about everything so the ride continues. You are forever in Our Thoughts Jane. Everything as usual was planned and mileage sorted to coincide with places and accommodation and our riding ability over various terrains. I had purposely trimmed the daily mileage back a little this year to allow for Inclement Scottish weather and the Unknown high terrain.